As a telecom consulting company, Clear CinCom is always on the cutting edge when it comes to new tools and technologies being introduced. We work with state of the art equipment and have developed a number of our own specialized measuring and optimization tools. While in principle we can work with any cellular radio technology, we do specialize in a number of specific technologies that are particularly important to our clients: GSM-R, LTE, UMTS, 802.11p and Tetra. Below is a more extensive overview of technologies we currently work with or have worked with in the past. Built on GSM-technology, GSM-R is a secure platform for voice and data communication for railway security, services and communications. It is used as a layer on which security and train tracking applications run, as well as video surveillance, passenger information systems and cargo tracking. 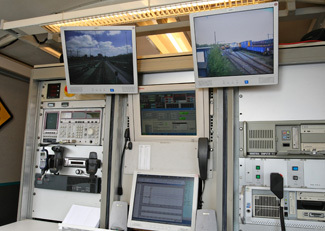 GSM-R is the standard for wireless railway communications in Europe, Asia and North-Africa, replacing dozens of legacy standards in use prior to the development on GSM-Rail. Read all about GSM-R. Read all about GSM-R.
IEEE 802.11p or ITS-G5 (Intelligent Transportation Systems) is becomming the new standard for car to car and car to roadside communication. Operating in the licensed ITS-G5 frequency band of 5.9GHz, it offers a communication layer for exchanging data between motorized road users and road side infrastructure. LTE (Long Term Evolution) and SAE (System Architecture Evolution) is a new standard set by the 3GPP, often marketed at '4G'. 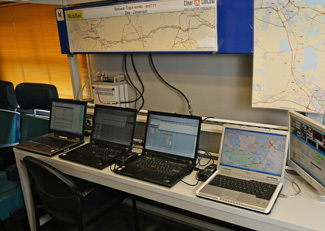 It is the next step in cellular radio networking, after third generation technologies such as UMTS. Thanks to simplified protocols and a flat, all-IP architecture, networks can now achieve higher data rates and lower latency. This makes LTE ideally suited for all kinds of multimedia services, voice, video, mobile TV and internet data. LTE increases throughput and available bandwidth, reduces costs, and can be deployed on existing 3G infrastructures. It can even be deployed as an upgrade from other platforms such as CDMA. Read all about LTE/SAE. UMTS is the main third generation technology for mobile telephony. An alternative to the GSM-standard, it offers high-speed data transfer capabilities with a theoretical speed of up to 14 Mbit/s. UTMS is widely implemented in most of the world and is often used for applications such as mobile video, video conferencing and high-speed Internet access. Read all about UMTS. TETRA (Terrestrial Trunked Radio) is mainly used for private mobile radio networks in the areas of public safety, transportation, oil and gas, military and so on. The standard is set by the ETSI (European Telecommunications Standards Institute) and had been adopted by a large number of manufacturers of communication equipment, hence enabling competition and making a wide range of interoperable devices available. Read all about Tetra networks. GSM (Global System for Mobile Communications) is the world standard for mobile telephony. Because it offers digital quality, it is considered a second generation standard (2G) for telephony. It can be complimented with various protocols for wireless data transmission, such as GPRS for packet data capabilities and EDGE for high-speed data transmission capabilities. GPRS (General Packet Radio Service) is often described as a second-and-a-half generation technology, adding mobile data services to the GSM-standard. Unlike previous technologies, GPRS allows for billing by the volume of data transferred rather than the typical charge-per-minute of traditional GSM-technology. This makes GPRS suitable as the underlying protocol for WAP access, SMS and MMS applications as well as for Voice over IP (VoIP)-services delivered to smartphones, tablets and other mobile devices. Enhanced Data rates for GSM Evolution (EDGE), also known as Enhanced GPRS (EGPRS), improves data transfer speeds and reliability. Like GPRS, EDGE is packet-switching technology that allows service providers to charge by the volume of data rather than having per-minute connection fees. EDGE is generally used for delivering multimedia services to smartphones, tables and other mobile devices. High-Speed Downlink Packet Access (HSDPA) is a third generation protocol building on the UMTS-standard, allowing for higher data transfer speeds. It requires nothing but a relatively simple software upgrade of existing UMTS-networks to allow for HSDPA-communications.